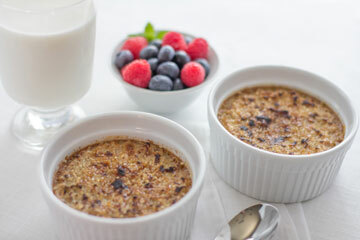 Get a nutritious start to your day with oatmeal creme brulee! Preheat oven to 350 degrees F. Spray 8×11-inch baking dish with cooking spray. Combine milk, eggs and vanilla in large bowl. Add oats, Splenda and salt; mix well. (Add cinnamon to taste, if desired). Pour into baking dish, spread oats as needed. Bake 40-45 minutes or until center jiggles, but is not runny. Edges should be lightly browned and may pull away from dish slightly. Remove from oven. Sprinkle brown sugar evenly over the top. Return to oven and bake until sugar is melted. Turn oven to broil and heat until sugar bubbles and browns slightly (about 1-2 minutes). Allow to cool, cut into 8 servings. Use more brown sugar on top if you want a sweeter dish or a more solid “crust” like that on traditional creme brulee. For a more filling breakfast, serve with cut up fruit, berries, fat-free yogurt or fat-free whipped topping.